Automated tests, in Java most commonly written with JUnit, are critical to any reasonable software project. Some even say that test code is more important than production code, because it’s easier to recreate the production code from the tests than the other way around. Anyway, they are valuable assets, so it’s necessary to keep them clean. 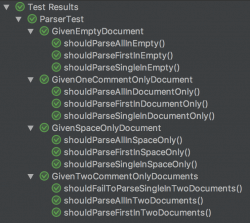 Adding new tests is something you’ll be doing every day, but hold yourself from getting into a write-only mode: Its overwhelmingly tempting to simply duplicate an existing test method and change just some details for the new test. But when you refactor the production code, you often have to change some test code, too. If this is spilled all over your tests, you will have a hard time; and what’s worse, you will be tempted to not do the refactoring or even stop writing tests. So also in your test code you’ll have to reduce code duplication to a minimum from the very beginning. It’s so little extra work to do now, when you’re into the subject, that it will amortize in no time. JUnit 5 gives us some opportunities to do this even better, and I’ll show you some techniques here. Any examples I can come up with are necessarily simplified, as they can’t have the full complexity of a real system. So bear with me while I try to contrive examples with enough complexity to show the effects; and allow me to challenge your fantasy that some things, while they are just over-engineered at this scale, will prove useful when things get bigger. If you like, you can follow the refactorings done here by looking at the tests in this Git project. They are numbered to match the order presented here. * Parse the one and only document in the input. * @throws ParseException if there is none or more than one. * Parse only the first document in the input. * @throws ParseException if there is none. We use static methods only to make the tests simpler; normally this would be a normal object with member methods. 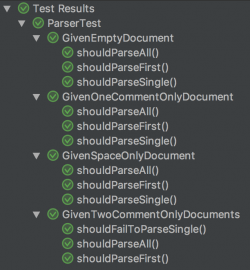 Following the BDD given-when-then schema, I first have a test setup part (given), then an invocation of the system under test (when), and finally a verification of the outcome (then). These three parts are delimited with empty lines. For the verification, I use AssertJ. The given... methods are called three times each, once for every parser method. The when... methods are called four times each, once for every input document, minus the cases where the tests expect exceptions. There is actually not so much reuse for the then... methods; we only extract some constants for the expected documents here, e.g. COMMENT_ONLY. But reuse is not the most important reason to extract a method. It’s more about hiding complexity and staying at a single level of abstraction. As always, you’ll have to find the right balance: Is whenParseSingle(input) better than Parser.parseSingle(input)? It’s so simple and unlikely that you will ever have to change it by hand, that it’s probably better to not extract it. If you want to go into more detail, read the Clean Code book by Robert C. Martin, it’s worth it! But I prefer methods to have names that say what they do, and as you can see in the first variant, setup methods are no exception. I sometimes even have several @BeforeEach methods in a single class, when they do separate setup work. This gives me the advantage that I don’t have to read the method body to understand what it does, and when some setup doesn’t work as expected, I can start by looking directly at the method that is responsible for that. But I must admit that this is actually some repetition in this case; probably it’s a matter of taste. Now the test method names still describe the setup they run in, i.e. the InDocumentOnly part in shouldParseSingleInDocumentOnly. In the code structure as well as in the output provided by the JUnit runner, this is redundant, so we should remove it: shouldParseSingle. Most real world tests share only part of the setup with other tests. You can extract the common setup and simply add the specific setup in each test. I often use objects with all fields set up with reasonable dummy values, and only modify those relevant for each test, e.g. setting one field to null to test that specific outcome. Just make sure to express any additional setup steps in the name of the test, or you may overlook it. When things get more complex, it’s probably better to nest several layers of Given... classes, even when they have only one test, just to make all setup steps visible in one place, the class names, and not some in the class names and some in the method names. When you start extracting your setups like this, you will find that it gets easier to concentrate on one thing at a time: within one test setup, it’s easier to see if you have covered all requirements in this context; and when you look at the setup classes, it’s easier to see if you have all variations of the setup covered. The next step gets a little bit more involved and there are some forces to balance. If it’s too difficult to grasp now, you can also simply start by just extracting Given... classes as described above. When you’re fluent with that pattern and feel the need for more, you can return here and continue to learn. You may have noticed that the four classes not only all have the same three test method names (except for the tests that catch exceptions), these three also call exactly the same when... methods; they only differ in the checks performed. This is, too, code duplication that has a potential to become harmful when the test code base gets big. In this carefully crafted example, we have a very symmetric set of three when... methods we want to call; this not always the case, so it’s not something you’ll be doing with every test class. But it’s good to know the technique, just in case. Let’s have a look at how it works. 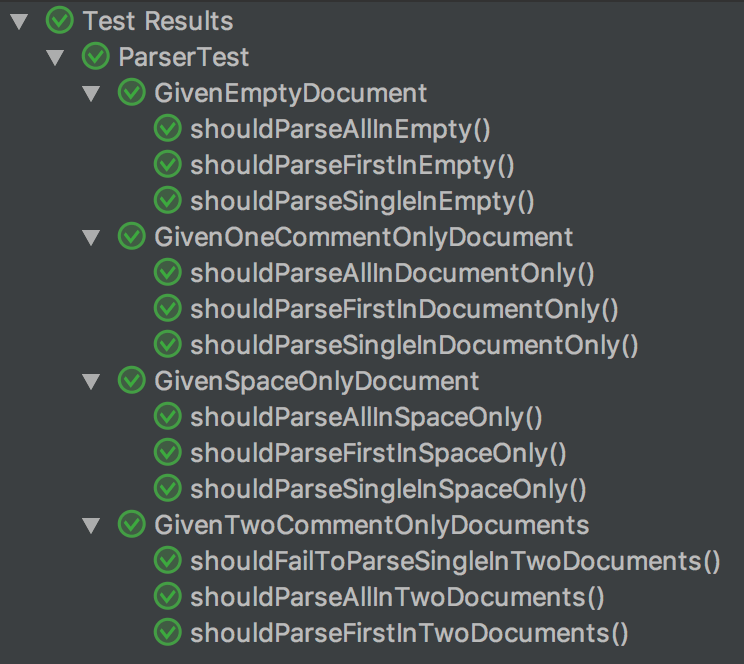 We can extract an abstract class WhenParseAllFirstAndSingle to contain the three test methods that delegate the actual verification to abstract verify... methods. As the when... methods are not reused any more and the test methods have the same level of abstraction, we can also inline these. The verification is done in the implementations, so we can’t say something like thenIsEmpty, we’ll need a generic name. thenParseAll would be misleading, so verify with the method called is a good name, e.g. verifyParseAll. This extraction works fine for parseAll and the whenParseAll method is simple to understand. But, e.g., parseSingle throws an exception when there is more than one document. 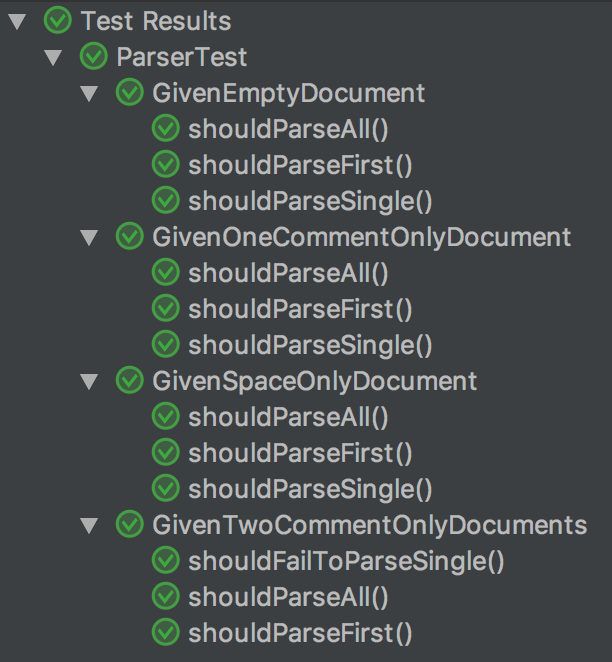 So the whenParseSingle test has to delegate the exception for verification, too. We have to pass the document from the closure back to the method level. I can’t use a simple variable, as it has to be assigned to null as a default, making it not-effectively-final, so the compiler won’t allow me to. Instead, I use an AtomicReference. All of this does add quite some complexity to the when... methods, bloating them from 2 lines to 6 with a non-trivial flow. Gladly, we can extract that to a generic whenVerify method that we can put into a test utilities class or even module. * Calls the <code>call</code> and verifies the outcome. * If it succeeds, it calls <code>verify</code>. * If it fails with an exception of type <code>exceptionClass</code>, it calls <code>verifyException</code>. This makes the implementation explode, but the call is okay now. If you have tests that only apply to a specific test setup, you can simply add them directly to that Given... class. If you have tests that apply to all test setups, you can add them to the When... super class. But there may be tests that apply to more than one setup, but not to all. In other words: you may want to have more than one When... superclass, which isn’t allowed in Java, but you can change the When... classes to interfaces with default methods. You’ll then have to change the fields used to pass test setup objects (the input String in our example) to be static, as interfaces can’t access non-static fields. This looks like a simple change, but it can cause some nasty behavior: you’ll have to set these fields for every test, or you may accidentally inherit them from tests that ran before, i.e. your tests depend on the execution order. This will bend the time-space-continuum when you try to debug it, so be extra careful. It’s probably worth resetting everything to null in a top level @BeforeEach. Note that @BeforeEach methods from super classes are executed before those in sub classes, and the @BeforeEach of the container class is executed before everything else. This is not so easy with the the other tests that are sometimes expected to fail (e.g. whenParseSingle). We chose an implementation using the whenVerify method (or the fluent builder) which we wanted to be generic. We could give up on that and inline it, but that would be sad. Alternatively, we could add the verification to all overridden verifyParseFirst methods, but that would add duplication and it’d be easy to forget. What’s worse, each new verification we wanted to add, we’d have to add to every verify... method; this just doesn’t scale. If you have more than one generic verification, it would be better to extract them to a verifyParseFirstGeneric method. To add structure to a long sequence of test methods in a class, group them according to their test setup in inner classes annotated as @Nested. Name these classes Given... and set them up in one or more @BeforeEach methods. Pass the objects that are set up and then used in your when... method in fields. When there are sets of tests that should be executed in several setups (and given you prefer complexity over duplication), you may want to extract them to a super class, or (if you need more than one such set in one setup) to an interface with default methods (and make the fields you set up static). Name these classes or interfaces When... and delegate the verification to methods called verify + the name of the method invoked on the system under test. I think grouping test setups is something you should do even in medium-sized test classes; it pays off quickly. Extracting sets of tests adds quite some complexity, so you probably should do it only when you have a significantly large set of tests to share between test setups, maybe 5 or more. I hope this helps you reap the benefits JUnit 5 provides. I’d be glad to hear if you have any feedback from nitpicking to success stories. To Rüdiger, the term agility is not a method but a canon of values founded on ultimate customer orientation, which includes pronouncing also uncomfortable truths. 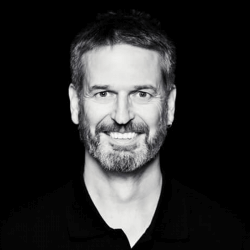 Rüdiger has been practicing this for much longer than the Agile Manifesto exists, in different roles, industries, company cultures, and technology stacks. Since January 2018 he works for codecentric in Karlsruhe, Germany.